This month I’ve been trying out a range of Ole Henriksen beauty products and if I’m honest I have mixed reviews. 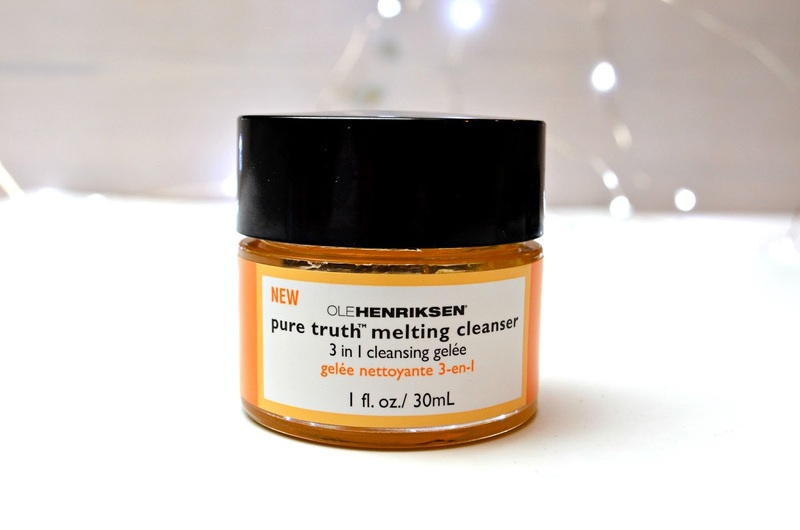 Today I’m going to be talking about the Pure Truth Melting cleanser, the newest product from the Ole Henriksen line of skincare. 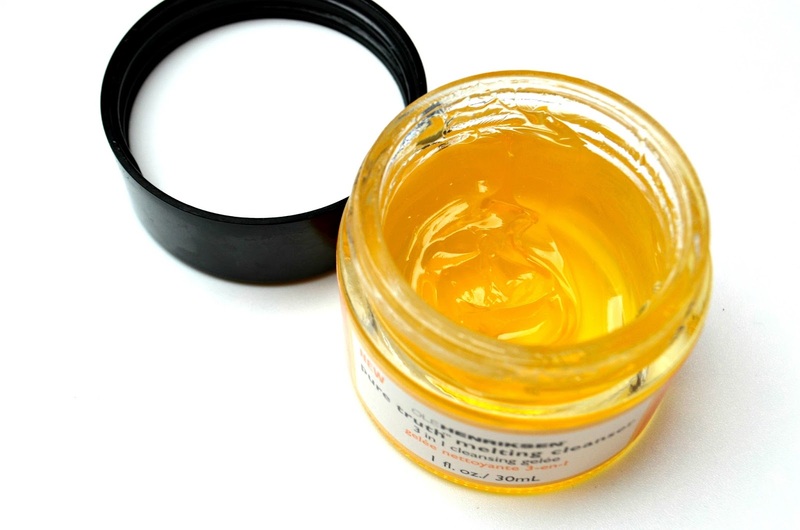 The melting cleanser comes in an orange glass pot with a black lid that screws off. As expected it’s quite heavy so not one I’d take if I was travelling around quite a bit. The cleanser itself is of a gel consistency. It’s not too difficult to scoop out with your fingertips and because it’s a tub it’s a lot easier to get the amount that you need. Generally I’m not a fan of products that don’t come in tubes. Although it’s easy to gauge how much product you want to use, I’m always slightly wary about how hygienic it is to keep dipping your fingers into the tub. Even before you unscrew the lid, you can smell the lovely mandarin smell. Generally I’m not a fan of orange-y scents but this one isn’t too over powering and smells quite fresh. The instructions are simple enough but what I did find strange was that they asked that you use the product on a dry face as opposed to a damp one. Still, I did as I was told and it works. I was a little bit disappointed that it didn’t turn into a frothy foam, so I just felt like I was moving the cleanser over my face as I scrubbed it. Since this is an oil based cleanser I wanted to see if all my makeup washes off without leaving traces – I did a micellar on cotton pan test to see whether any makeup was left over and unfortunately I did need to wash my face again. I don’t use the cleanser in my eye area so I wouldn’t be able to tell you how good it is at removing eye makeup either. Once I’ve used it and dried my face, I’m left with a feeling that there’s something left on my face. It’s a strange sensation, almost like a film left on your face. I don’t have very dry skin but I presume if you did have, this would work pretty well for you however for me it just felt like I hadn’t washed my face properly. I did however like that it isn’t drying in any way, nor did it leave my skin feeling tight after use. The cleanser boasts to have Vitamin C, Rose Hip, and Virgin Cherry Oils, which brightens, repairs, and nourishes the skin. Water activated, the unique oil emulsifies to milk that rinses clean, leaving skin refreshed, healthy, and luminous. As interesting as it sounds, I just didn’t think it worked for my skin which is normal-dry skin type. After finishing an entire tub, I don’t think I’ll be repurchasing it. It may work for some people (particularly those with dry skin) however it just isn’t a powerful enough cleanser for me. It’s been just over a month and I haven’t noticed huge changes with my skin nor did I find it removed all my make up. Sorry Ole Henriksen, this one is a no no for me.